Here’s another rerun, this one from 2010. I just got back from the Las Vegas trip and the Challenge Entertainment National Trivia. My team competed against 201 other teams from across the country. We managed to squeak out the win during the Final big question, rising from 4th place at half time and third place before the final question. I’m still on an adrenaline high and should be back to the normal review schedule next week. Until then, sit back and enjoy the stories on one of my favorite novels and writers. This is the rerun of the 2nd in my series of Forgotten Books from 2010. When I do the reviews of the Forgotten Books each week, you will learn a little of my past. Most will deal with Texas writers of Science Fiction, Fantasy, and Horror. So we move to a sad story. I met Tom Reamy in 1974 at the second science fiction convention I ever attended, AggieCon 5. He was there promoting MidAmericon, the 1976 World Science Fiction Convention which was going to happen in Kansas City, just a few weeks after I graduated from college. Tom was an affable guy, a Texan by birth and upbringing, and a beginning writer. At that convention I bought a membership to the WorldCon and a copy of Tom’s short story “Twilla” in The Magazine of Fantasy and Science Fiction which I got him to sign. He came back the next year where we discussed his award winning story “San Diego Lightfoot Sue.” I last saw him in 1977 when I got my copy of “The Detweiler Boy,” also in F&SF, signed. I read those stories and saw an amazing talent, particularly in “Twilla.” We talked and he had great stories of Texas fandom from the ’50s and ’60s. He would not talk about Big D in ’73, the aborted WorldCon bid for Dallas. That was still a sore subject. I found other stories, and you could see that he was the real deal. And he was not a newcomer to the field. He had been nominated for a Hugo for his fanzine Trumpet and had won the John W. Campbell Award for Best New Writer. In 1976, I went to my first WorldCon and I looked up Tom there. He was associated with the film program and it had amazing content. I vaguely remember watching five films back to back in the hall. They included A Boy and His Dog, Dark Star, Tales of Hoffman and The Last Days of Man on Earth. My brain went into overload. So, when he sold his first novel, I was excited. This was going to be the start of a truly amazing career. Then, at age 42 in 1977, he had a heart attack and slumped over his typewriter, where he was later found. We got one novel (which was in the revision stage) and a handful of stories. (There is still one story which has yet to be published, though it may theoretically appear if the anthology-which-is-not-to-be-named ever appears. At this point it is nearly 35 years past due). BLIND VOICES is a quiet pastoral fantasy with hints of Clifford D. Simak and more than hints of Ray Bradbury and Jack Finney. It is not a flashy, pyrotechnic spectacle. Rather, it is a musing on life in the Depression in the Plains. Hawley, Kansas, was the setting for several stories in Reamy’s output, most notably “Twilla” (which was a Nebula finalist when it appeared). And some characters appear in multiple works. It is the story of three girls, just out of high school, looking to the future and trying to enjoy a last summer before they enter the real world. Into this sleepy town comes Haverlock’s Traveling Curiosus and Wonder Show with its assortment of freaks and oddities. The freaks here include Tiny Tim who stands 12 inches tall, the Minotaur, Medusa, Electro the Electric Man, the Little Mermaid, the Snake Woman, and Angel the Magic Boy. The girls go to the show when the local cinema is invaded by a skunk with a temper. Together, they look for magic and adventure, they look for life and excitement, even danger. And they find it all. Our primary viewpoint character is Evelyn Bradley, who attends the show with her friends Francine and Rose. Each girl finds love and adventure, each finds death and danger. None is ever the same after the brief two days covered in the telling of the tale. 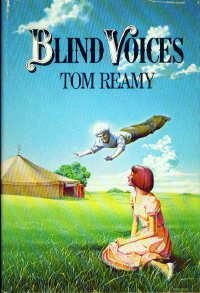 I have said in a number of occasions that Tom Reamy was going to be my generation’s Ray Bradbury. I still stand behind that statement, though he may have been able to surpass him. His loss was a blow to me when I got the call about it, and it was also a loss to the field. The novel is currently in print from Wildside Press with a truly hideous cover that has no immediate reference within the book. The written matter contained within, however, will grab you with the poetry of the prose and with the vividness of its setting. As I did a little research on the web I found first that the book has a five star rating on Amazon. An amazing feat. There are a few reminisces of Tom out there. People who read the book remember it fondly, even fervently. That it is Forgotten is a shame. I re-read it this last week and the power is still there. Now I need to go find the short stories or the short story collection San Diego Lightfoot Sue and Other Stories and remember.